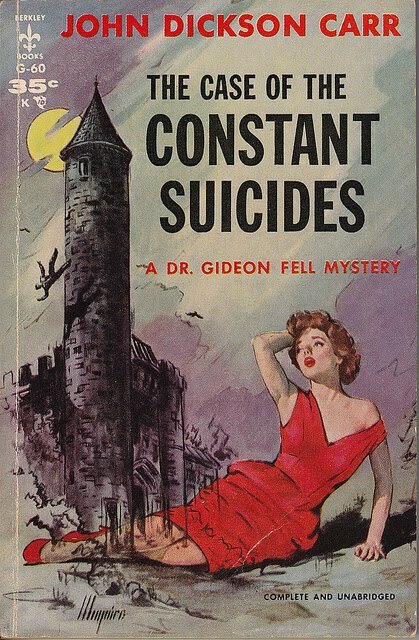 John Dickson Carr was considered to be a master of the locked-room mystery, and in The Case of the Constant Suicides (written in 1941) he gives us not one but two locked-room puzzles! One of which has a particularly ingenious solution. An interesting feature of the book is that Carr’s detective, Dr Gideon Fell, keeps somewhat in the background. Mostly we see things through the eyes of two young scholars, Alan Campbell and his distant cousin Kathryn, who met unexpectedly when both are summoned to Scotland after the apparent suicide, or possible murder, of old Angus Campbell. Carr goes to a great deal of trouble to show us the many differences between English Law and Scottish Law. Apart from being interesting in their own right, at least one of these differences turns out to be fairly important to the plot. 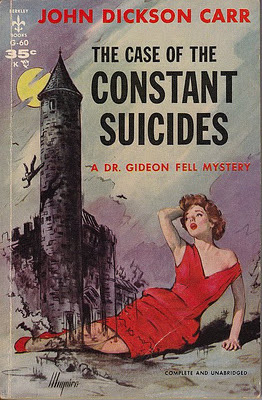 It’s all highly entertaining – Carr gives us a remote Scottish castle (really just an old house but with a suitably mysterious tower), a suggestion of ghosts, old family scandals, lots of colourful minor characters and a complex but rewarding plot. I loved it. The Third Round was, as its name suggests, the third of the Bulldog Drummond novels written by Herman Cyril McNeile under the pseudonym Sapper. And it’s just as much fun as the first two. Written in 1924 it is of course a product of its time. If you like your adventure fiction to be politically correct and culturally sensitive then you won’t like the Bulldog Drummond stories. Drummond believes in all sorts of discredited ideas, things like honour and decency and patriotism and loyalty. The first Bulldog Drummond novel introduced us to Captain Hugh Drummond, an officer who was finding peacetime rather dull. He had served with distinction in the Great War but found adjustment to the postwar world somewhat difficult. He had placed an advertisement in the newspaper offering his services in any kind of adventure as long as it didn’t conflict with his personal code of honour. Drummond was a man not overburdened with either good looks or the higher intellectual gifts but possessed of commonsense, great physical strength, immense courage and a considerable quantity of low cunning, qualities that had allowed him to survive the dangers of war. He soon found himself matching wits with ruthless diabolical criminal mastermind Carl Peterson. Their duel continues throughout the first four novels. The Third Round finds Drummond draw into the affairs of an eccentric scientist who has discovered a means of producing perfect artificial diamond, in almost limitless quantities. Not surprisingly this had upset the syndicates that control the diamond trade. The trade is strictly regulated in order to keep prices as high as possible. No the established players in the trade face ruin. Their response is to employ someone to kill the scientist. As it happens, an old pal of Drummond’s hope to marry the scientist’s daughter. Drummond is informed of the threats that have been made, and his problem now is to keep a very cantankerous, very stubborn and very uncooperative scientist alive. Peterson has plans of his own, plans that the diamond syndicates may well find to be even more disadvantageous than the eccentric professor’s original invention of the diamond-manufacturing process. There’s action in abundance, plenty of narrow escapes, and countess opportunities for Drummond to display the qualities that earned him his nickname of Bulldog Drummond. Great entertainment, and highly recommended. Toby Jugg, the hero of Dennis Wheatley’s 1948 novel The Haunting of Toby Jugg, is a young fighter pilot in 1942, now confined to a wheelchair after being shot down. He is also the heir to a considerable fortune, a fortune that is being administered by a board of trustees until he comes of age. He is convalescing at one of his family’s country properties in Wales. He is becoming increasingly disturbed by a strange presence, a mysterious shadow cast by the moonlight through a gap in the blackout curtains, a shadow that he is convinced is cast by a malevolent and unnatural entity trying to gain entrance to his room. Toby is unable to convince anyone of the reality of this entity, and he slowly comes to believe that there is a plot against him, a plot to send him mad, or to make it appear that he is already mad. Is this some form of hallucination? Is this unearthly creature real or a product of his imagination? Do the people caring for him actually intend his destruction, or are they sincerely concerned for a young man whose grip on sanity is steadily weakening? The story is told in the form of Toby’s secret journal. Wheatley was really a writer of thrillers, some of which involved occult forces and some of which involved purely human evil. It’s really an elaborate and bizarre conspiracy theory story rather than a conventional horror story. It’s impossible to take it seriously, and that’s the very quality that makes it vastly entertaining and extremely amusing even for readers who don’t share Wheatley’s political beliefs. You have to admire someone who can weave together such a complex and eccentric paranoid fantasy involving Communists, Satanists, Freemasons and modern theories of education. 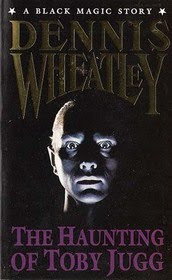 As a horror thriller it’s exciting and gripping – Wheatley demonstrates considerable skill in building up an atmosphere of menace, suspicion and supernatural dread. I don’t think very many readers could approach this book the way its author presumably intended it to be approached, but if you read it with the right kind of camp sensibility it really is outrageous fun. Graham Greene’s 1936 novel A Gun for Sale is probably better known for the 1942 movie adaptation, the classic film noir This Gun for Hire. 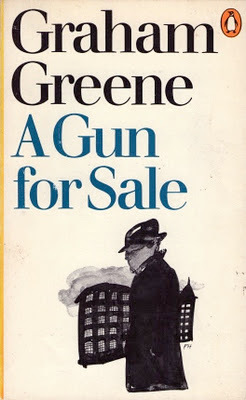 In fact the movie, while excellent, bears little resemblance to Greene’s novel. In the novel the professional hitman, Raven, is a profoundly ugly man and it’s suggested that his anti-social habits may have a great deal to do with his ugliness. He has been employed to carry out a political assassination, a deed that may well plunge the world into war. The consequences of his actions do not occur to Raven until much later. The novel as written at a time when it was fashionable to see wars as something that were brought about by the machinations of corrupt financiers and industrialists and it’s surprising to see a writer as intelligent as Greene falling for such naïve explanations. This is one of the books that Greene classed as “entertainments” rather than novels and it’s certainly a lesser work. The complex personal interactions between Raven and Anne and the psychological dissection of Raven’s severely warped personality are the book’s strengths and they’re the reasons to read this book. Recommended as a reasonably good example of the dark, corrupt and twisted world that Green was so good at creating. Eric Ambler’s 1953 novel The Schirmer Inheritance isn’t quite a crime novel, or at any rate certainly not a conventional one. It’s perhaps best described as a mystery thriller with a dash of international intrigue. It’s somewhat in the style of Graham Greene’s cloak-and-dagger novels. Ambler and Greene took the spy/adventure story as written by people like John Buchan and seasoned it with lots of cynicism, and a certain amount of black humour. 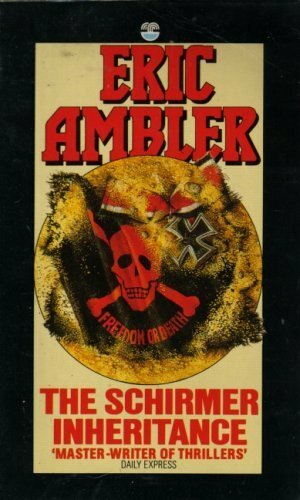 The Schirmer Inheritance is typical of Ambler’s work in having an amateur, in this case a young attorney, who becomes involved in a web of mystery, crime and international politics. Sent to Germany in 1949 to trace a possible heir to an American soft-drink fortune he finds itself drawn into a story that started during in 1806 during the Napoleonic Wars when a Prussian dragoon deserted his regiment, and which now leads him to Greece in the midst of civil war as he follows the trail of a young German sergeant killed by partisans in World War II. It’s a fascinating and unusual story, told with great skill and with Ambler’s gift for striking characterisation. A very entertaining read, and a book I recommend very highly. If you haven’t discovered Eric Ambler then you’re missing out on a very fine and underrated writer. Simon Templar, known as The Saint, is the most famous fictional example of the criminal turned crime-fighter but before The Saint there was the Lone Wolf. 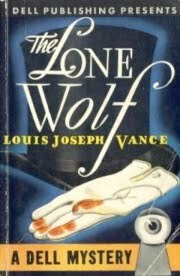 This character featured in eight books written between 1917 and 1934 by Louis Joseph Vance. Michael Lanyard was English-born but brought up in slightly disreputable circumstances in Paris. He has no clear idea who his real parents were. A chance meeting with an Irish thief named Bourke sets the young Lanyard on the road to crime. He becomes the famed jewel thief known as the Lone Wolf. The first novel in the series, The Lone Wolf, gives us a brief account of his childhood and, more importantly, an account of the events that lead him to abandon his evil ways. He runs foul of a shadowy underworld organisation and finds himself hunted both by his fellow criminals and by the police. He is framed for the murder of a Scotland Yard inspector in a Paris hotel. And he meets Lucy Bannon. She is involved with the mysterious criminal gang that is out to get him but she is not a wiling accomplice to their crimes. Michael Lanyard finds himself in love for the first time, and for the first time in his life he feels the desire to break free from his criminal past and to make amends for his misdeeds. Perhaps if he can prove himself worthy of Lucy’s love he can find both redemption and happiness. His first difficulty is simply to stay alive. Lanyard is an interesting variation on the gentleman thief as personified by such famous fictional characters as Raffles and Arsène Lupin. He may or may not be a gentleman by birth but he is certainly not one by upbringing. He is however gifted with a great deal of natural ability, and not just in the area of burglary. He has been able to pass himself off quite successfully as a gentleman. There’s enough adventure, action and romance to keep most readers happy although the book doesn’t have the style and panache of Leslie Charteris’s early stories of The Saint. The Lone Wolf went on to feature in two dozen movies and a TV series although the TV version being set in the US in the 50s lacks the flavour of the original. 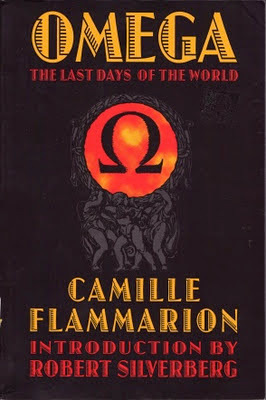 Camille Flammarion (1842-1925) was a French astronomer and a noted populariser of science. 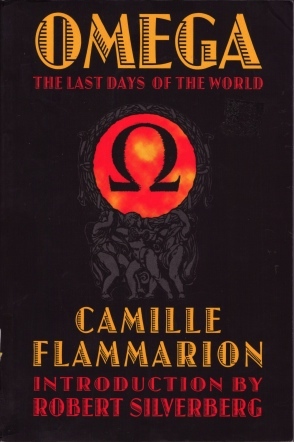 He also wrote a number of science fiction novels, including Omega: The Last Days of the World. Published in 1893, it’s a rather unconventional work and it’s debatable whether it can really be considered a novel. It’s more of a fictionalised speculative essay. It opens with the world about to end. It is the 25th century and a comet is on a collision course with the Earth. Most scientists initially agree that the results will be catastrophic and will almost certainly lead to the extinction of all life on the planet. Later dissenting voices are raised and at an international conference a panel of scientists explain their varying theories on how the Earth really will die, several million years in the future. The predictions of doom turn out to be false. The book then changes gears abruptly and traces the future history of mankind, with civilisation and technology progressing and our species continuing to evolve towards greater and greater intelligence. Then, after a few million years, with the Earth’s water having disappeared and with the planet becoming more and more uniform as mountain ranges vanish and only an endless unbroken plain remains, civilisation starts to decay. The book then changes gears again and takes on a mystical aspect as the end of everything turns out not to be the end of everything. As always when scientists try to predict the future Flammarion gets almost everything wrong. On the other hand you have to admire the truly epic sweep of this book, something that had not really been attempted in science fiction prior to this time. As well as being a future history it’s also a utopian vision although like most utopias it could be seen by sceptics as a dystopia if you don’t share Flammarion’s naïve faith in world government or his enthusiasm for a single global monoculture. It’s a bold attempt to present scientific ideas in the form of fiction but I’m not sure it really succeeds. Having no characters to relate to added to the sheer scale of the time period it covers makes it difficult to engage with the story so it doesn’t really work as fiction. Flammarion’s passion for science was matched by his enthusiasm for spiritism and related mystical beliefs and the combination is a little disconcerting. An interesting historical curiosity, certainly worth reading if you’re fascinated by the history of the science fiction genre.